Vice Versa - ZineWiki - the history and culture of zines, independent media and the small press. Vice Versa is a fanzine published anonymously by Eydthe Eyde in the 1940s in Los Angeles, California. 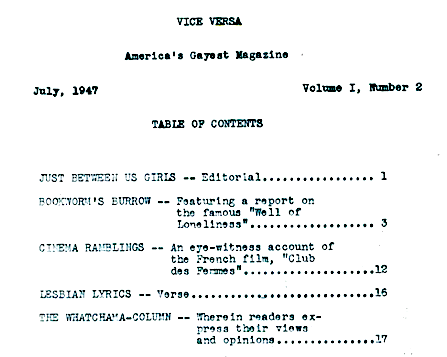 U.S.A.
Vice Versa is credited as being the first publication to appear devoted to lesbians. It was created by Eydthe Eyde, who typed each issue while at work as a secretary at RKO studios using a carbon paper to make 4 copies, and then repeating the process to create 10 copies of each issue. Although not usually referred to as a "zine", Eyde was involved in the science fiction fanzine community of that era, so there is reason to believe she was following in this tradition and that the first publication for lesbians in the U.S.A. could, indeed, be called a zine. The cover consisted of only the title, typed directly in the center of an otherwise blank sheet of paper. The first issue of Vice Versa, appearing in June 1947, was mailed to friends of Eyde. When she learned it was illegal in the U.S.A. to mail any material about gays or lesbians, she delivered the zine by hand to readers. Vice Versa consisted of book and movie reviews, science fiction stories by Eyde, and contributions by Forrest J. Ackermann, editor of Voice of the Imagi-Nation. Nine issues were released. Eydthe stopped publishing in February 1948 when she lost her job at RKO Studios. In the science fiction fan world, Eyde was known as 'Tigrina', contributing to fanzines under this name. In March 2011 there was a copy of one of the 10 copies of the first issue for sale on eBay from the personal collection of Forrest Ackerman. There were no bids placed, and the zine was withdrawn from sale. This page was last modified on 7 March 2015, at 12:58.